Utsa yellow Kurta is a collection of utra yellow printed kurtis. Thie utsa kurtis online show casing a trendy tie-and-dye patterns throughout. This yellow kurtis is from Utsa is by westside retail garment stores in India. 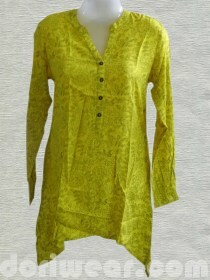 This printed yellow color Utsa kurta online once picked, will elevate any wardrobe of ladies. This Yellow Utsa kurta is stitched with a high-low hem from a pure cotton fabric, this ethnic apparel comes fashioned with a button placket and tab sleeves. Website provide a wide range of Utsa Kurtis online. Utsa kurtis also avalibale for wholesale buyers. We are appointing franchisee of DORIWEAR nation wide. Contact us for franchisee details terms and condition, if you are looking for a garment business. We have wide range of ladies tops and kurtis of international brands.